Happy holidays! I had an excellent Christmas filled with good food, family, and friends. The star gift so far has been my mom’s Christmas gift for my dad: a Keurig brewer. We’ve all been obsessively making coffee in it – it’s so cool! I’m not even a huge coffee drinker but I had two cups today because it’s just so easy and delicious (once I add my peppermint mocha creamer of course). I got a couple new cookbooks for Christmas so I’m really excited that I have so many new recipes to try out! Even though I took a little break from blogging the past few days due to holiday festivities, I have not taken a break from cooking and baking. I have so much that I can’t wait to share! 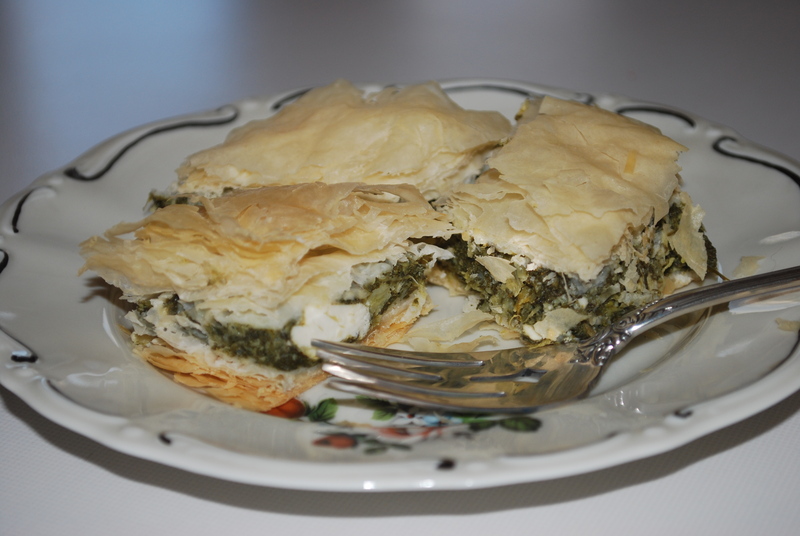 First on my list is what is probably my favorite food in the entire world: Spanakopita. 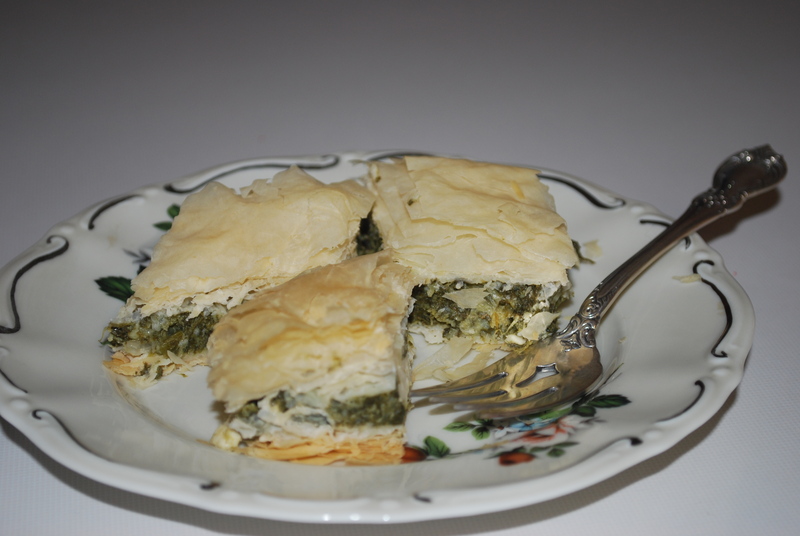 Not just any Spanakopita, but The Best Spanakopita Ever! As you have probably deduced from my blog’s name, I come from a Greek family. My parents were both born in Greece and my mom makes a lot of traditional Greek recipes. 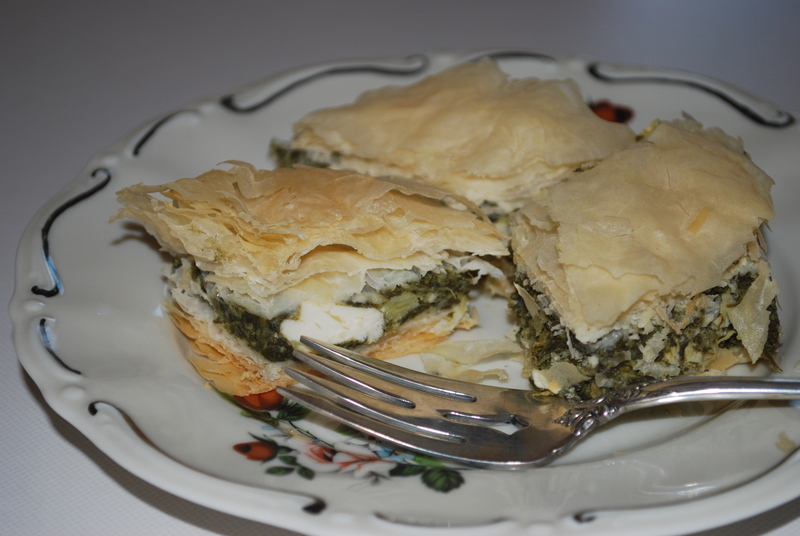 Her recipe for Spanakopita is absolutely incredible. It seems like a pretty big claim for me to make by saying her Spanakopita is the best Spanakopita ever when there are plenty of other Greeks out there who make the dish and probably think theirs is the best. However, I stick by my assertion since it’s the best I have ever tasted and if you make it, you will probably think so as well! 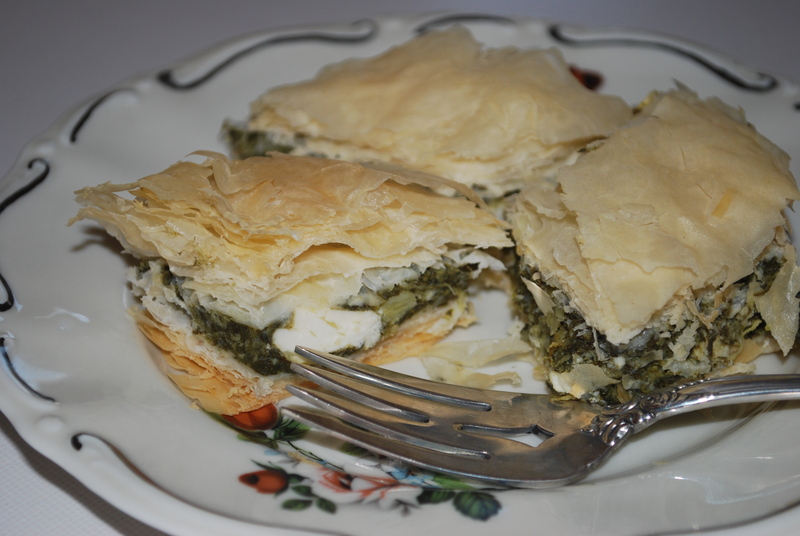 If you have never had Spanakopita, it translates in English to “Spinach Pie,” but honestly that doesn’t sound extremely appetizing. 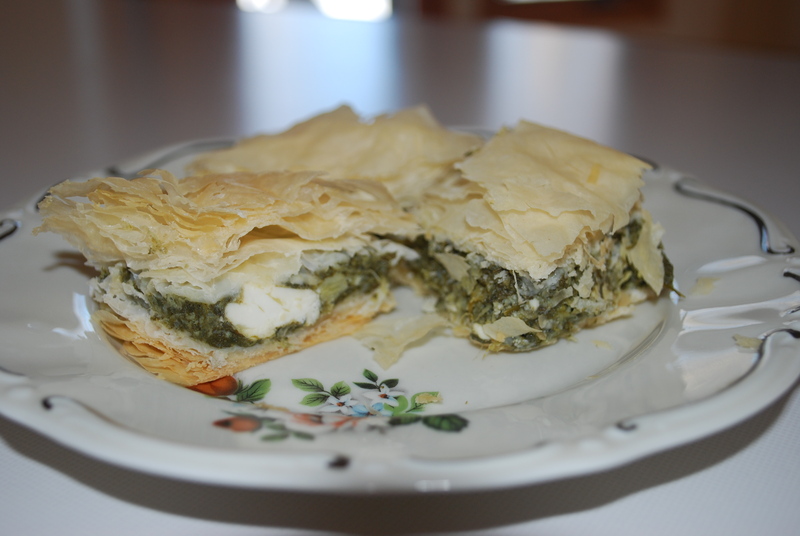 What it really is, is a spinach, onion, and feta mixture in between buttery layers of fillo dough. It’s delicious! 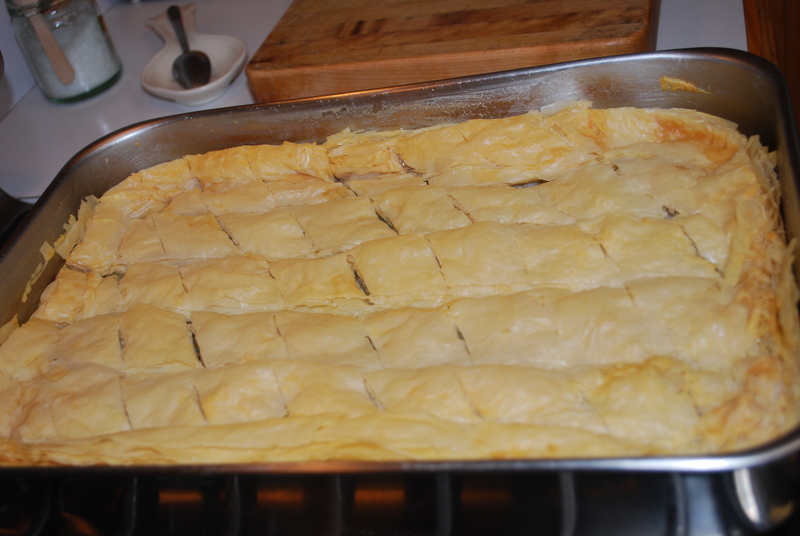 With that being said, here is my mom’s Spanakopita recipe, which in my opinion is THE BEST. I’d love to hear if you try it out! First, preheat your oven to 350. 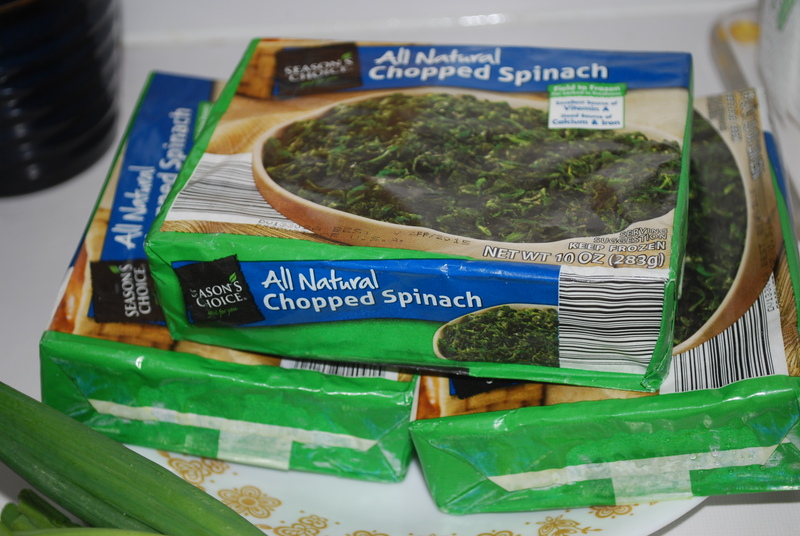 Next, take 3 10-ounce packages of frozen spinach that should be thawed and drain the spinach really well. Now you can start chopping. 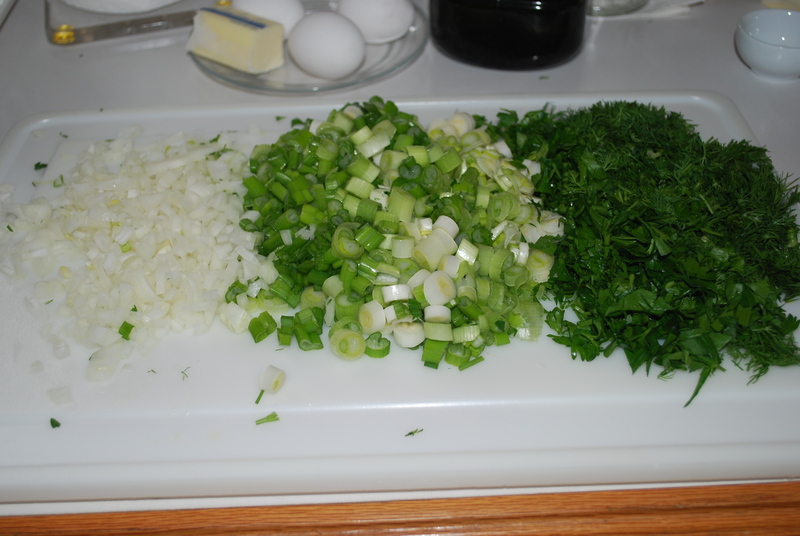 You will need to finely chop 1 yellow onion, 1 bunch (about 2 cups) green onions, 1/2 cup parsley, and 1 cup dill. 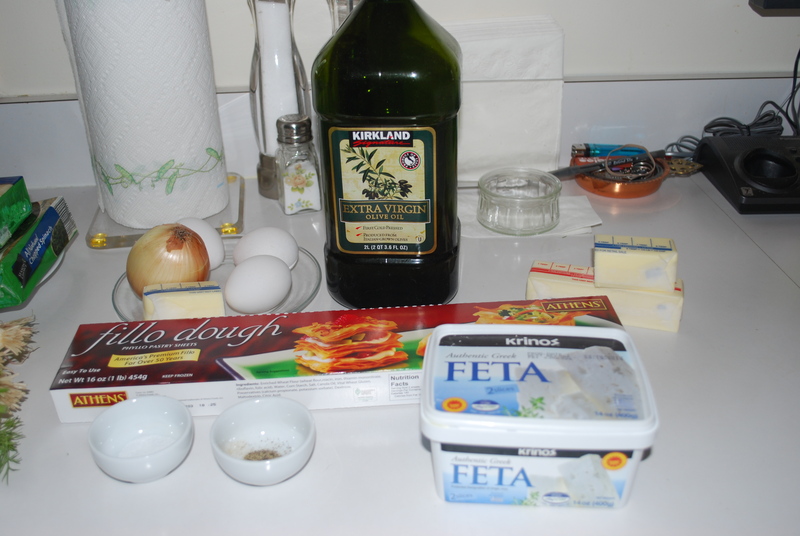 You should also crumble 1/2 pound Feta cheese to have it ready. 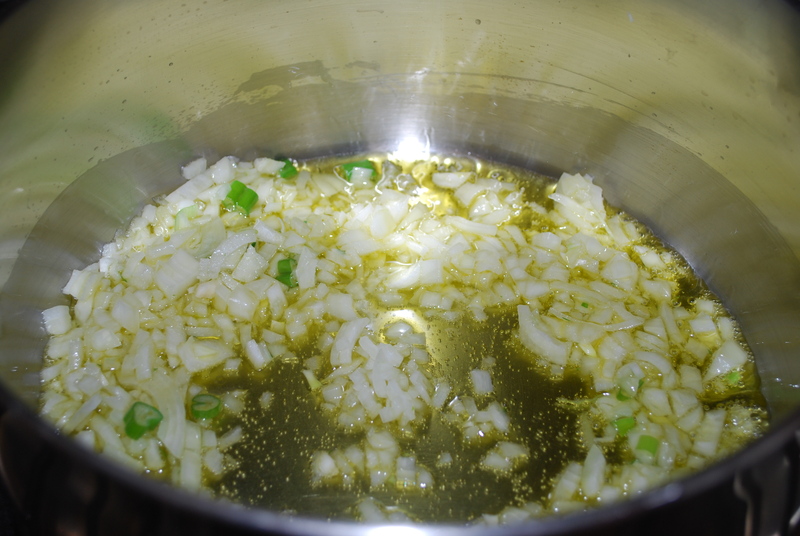 In a sauce pan, heat 1/3 cup extra virgin olive oil and saute yellow onion until golden, about 5 minutes. 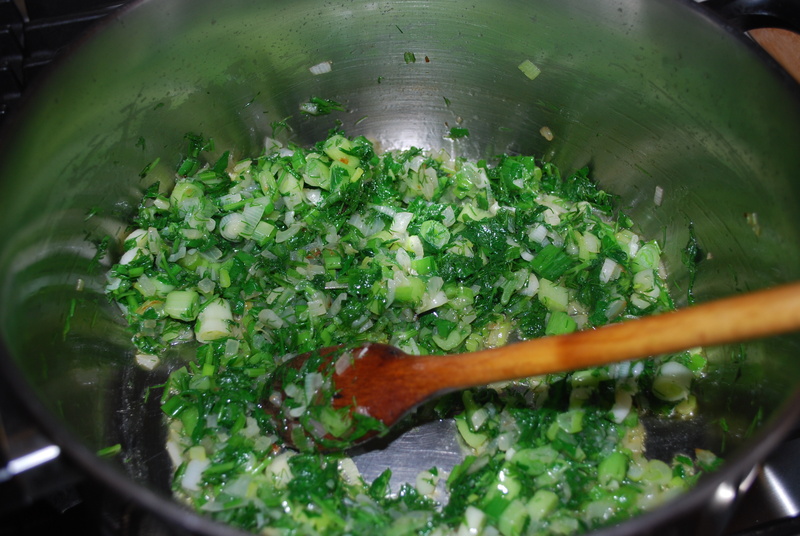 Add in the green onion, parsley, and dill, and saute another 5 minutes. Add in the drained spinach and stir for about 5 more minutes. Remove the sauce pan from heat. 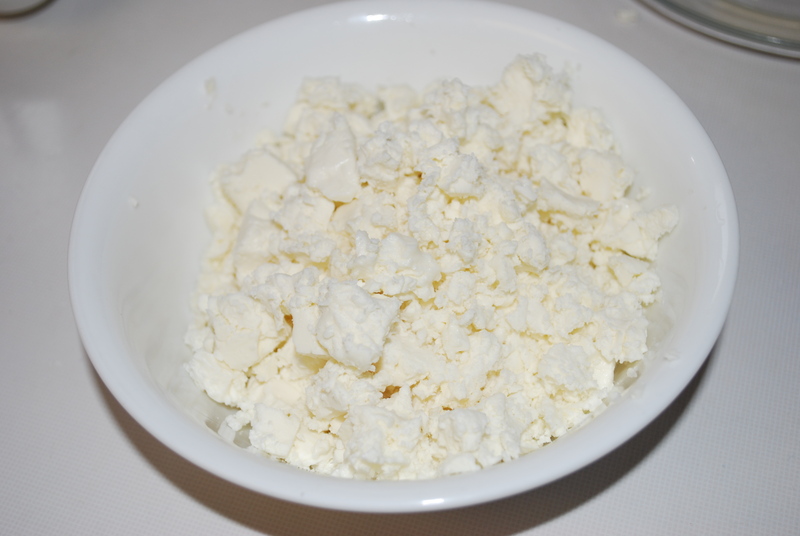 Once the pan is removed from the heat, mix in the crumbled Feta. In a bowl, whisk together 3 eggs. Make sure to whisk them very well. 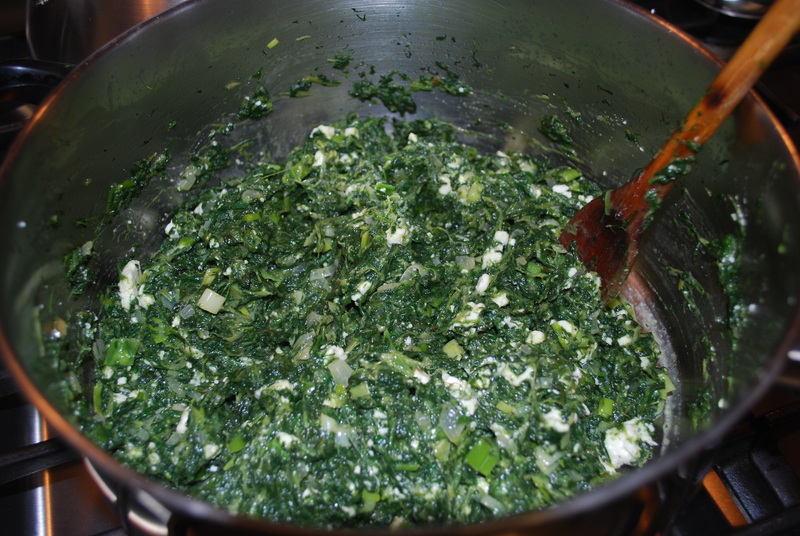 Very slowly add the eggs into the spinach mixture, mixing it very well as you add them. You want to make sure the eggs aren’t cooking at the bottom of the pan before they get mixed into the spinach. 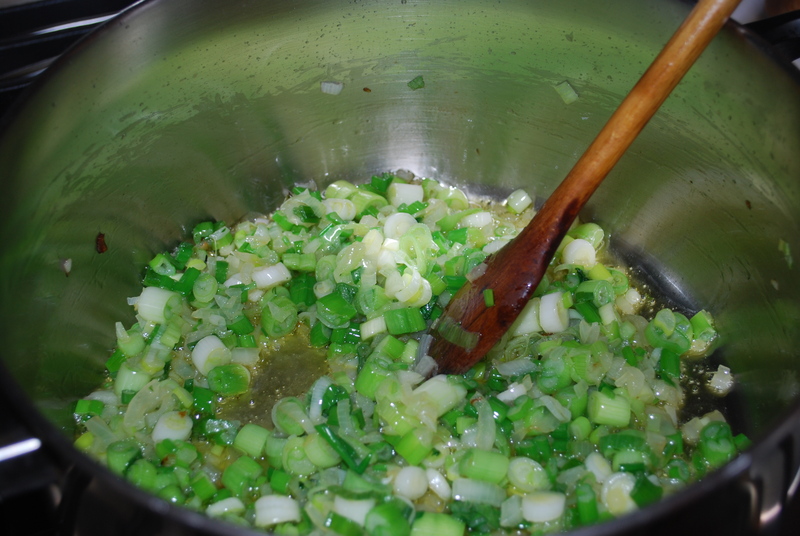 Season your mixture with salt and pepper to taste. You can be pretty liberal with the salt in here. 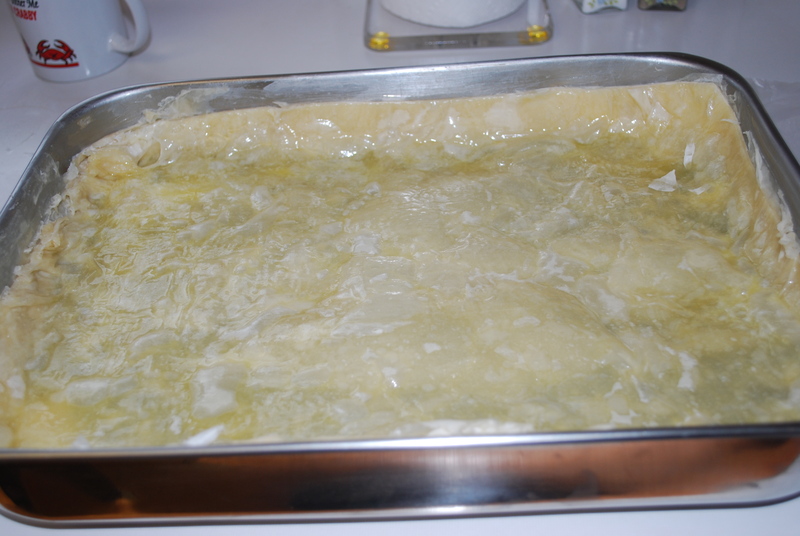 In a different sauce pan, melt 3 sticks of butter. You will use this butter on the fillo dough. Now prepare your baking pan. Take a 13x9x2 in. pan (or the closest you have ) and brush it with melted butter. Get your Spanakopita station set up. You will need the baking pan, the spinach mixture, melted butter and a brush, and 1/2 a box of fillo sheets laid out on a clean surface. 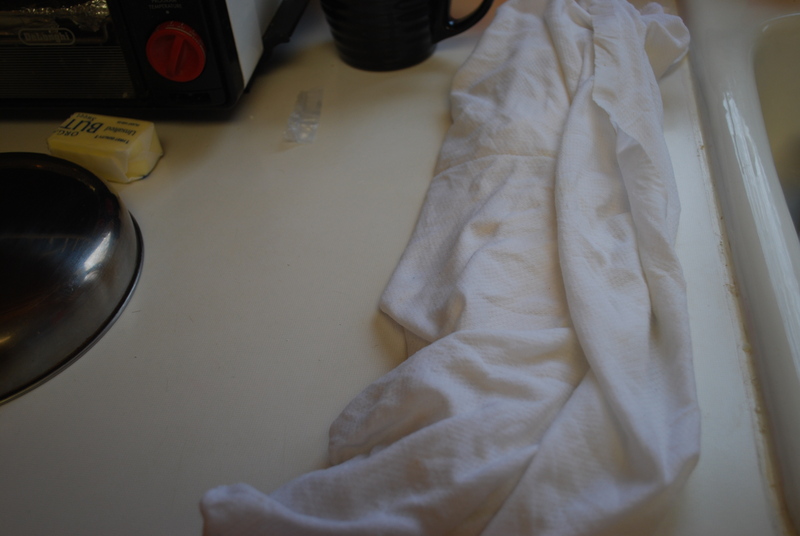 Put the other half of the box aside for now, covered with a damp towel so the fillo sheets do not dry out while you’re working. 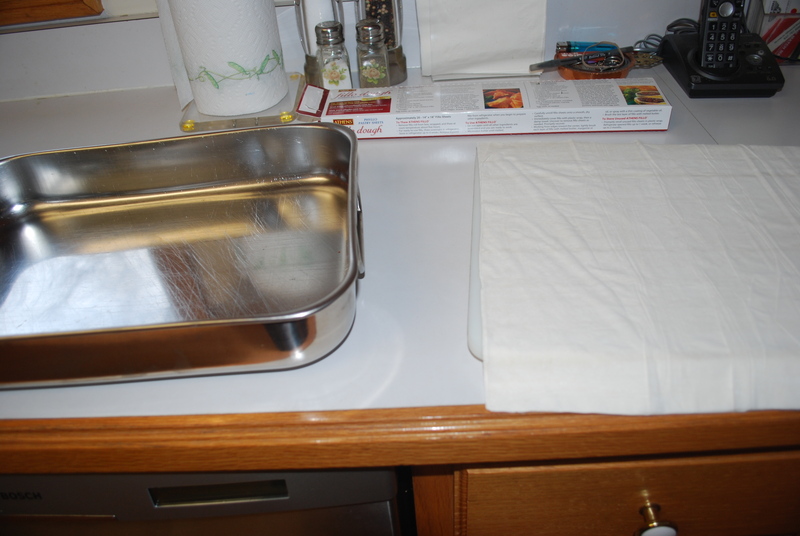 Lay one fillo sheet on the buttered baking pan, then brush the sheet with butter. Repeat with the rest of the 1/2 box of fillo sheets. 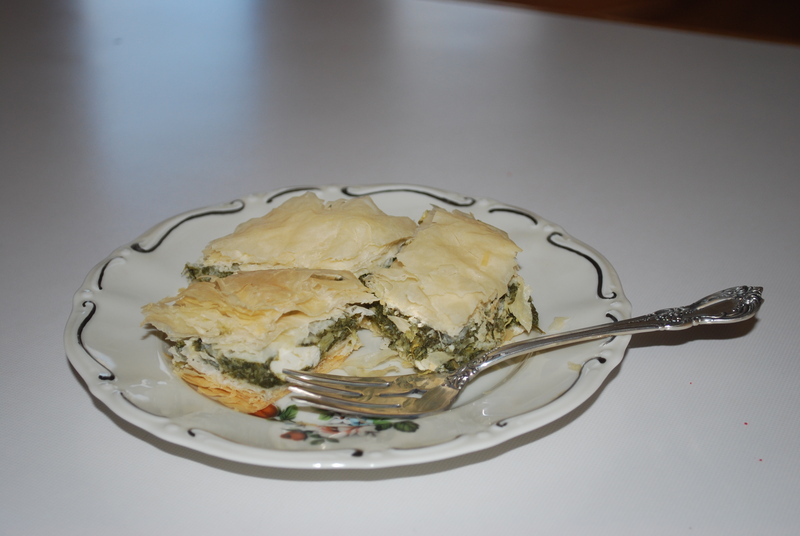 Once you’ve layered 1/2 the box with butter in the baking pan, pour the spinach mixture on top and spread it evenly. 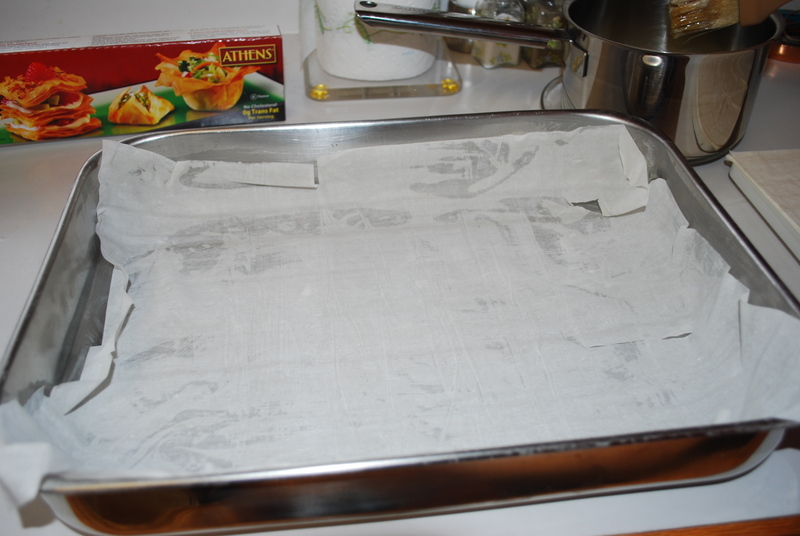 Next, take out the rest of the fillo sheets and lay them out on a clean surface. 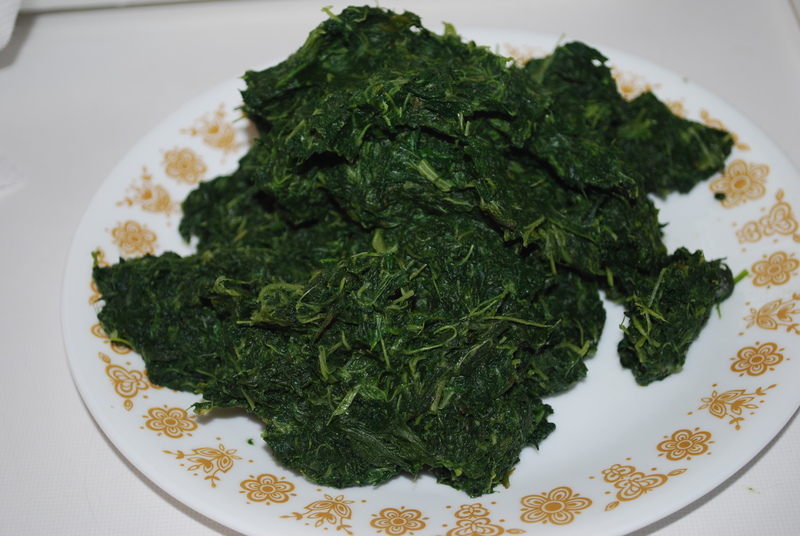 Lay one fillo sheet on top of the spinach mixture, then brush with melted butter. Repeat until you have used all of the fillo sheets. Pour the rest of the butter on top. Using a razor or a sharp knife (my mom likes to use a razor), trim off any uneven edges of fillo. 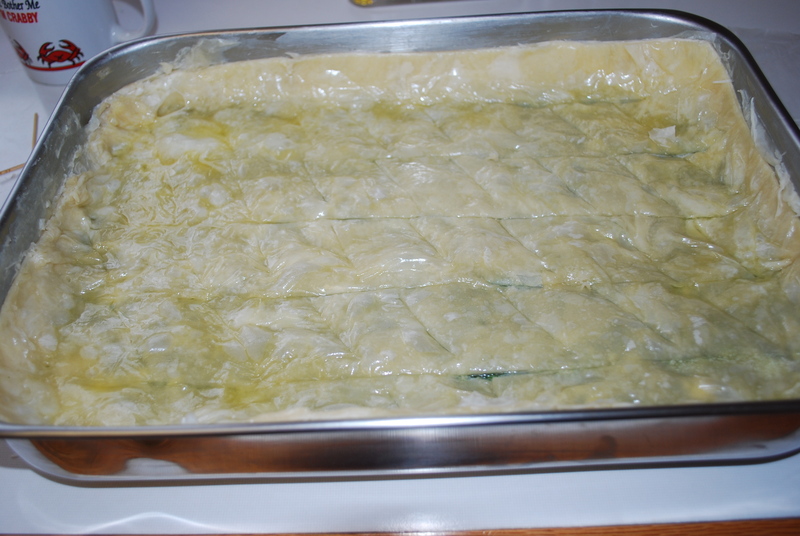 Cut through only the top layer of fillo so that you can make neat cuts later on, after the Spanakopita has cooked. Cut horizontally across the pan, then cut diagonally across the horizontal cuts to make diamonds. 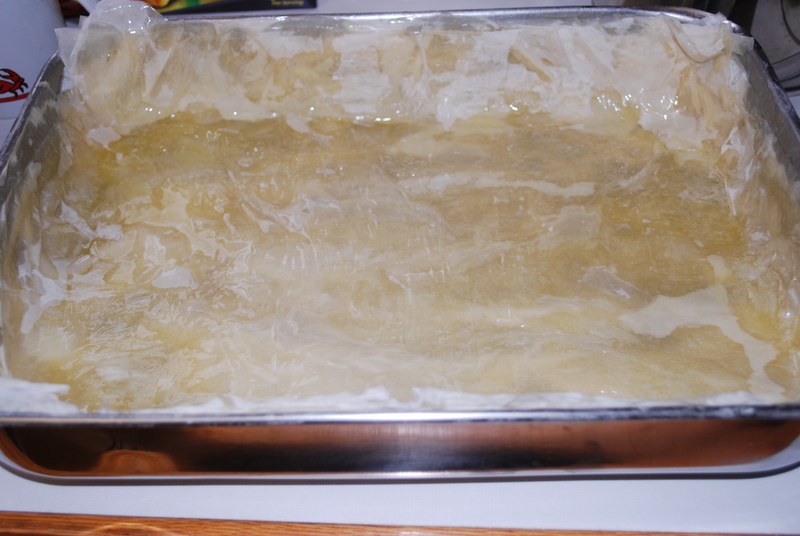 Place Spanakopita in the oven and cook at 350 for around 45 minutes, or until the pastry is puffy and golden. We ended up having to cook ours about 1 hour, so the time will probably depend on your oven – just make sure you wait to take it out until the pastry is golden. Preheat oven to 350. Take fillo out of the fridge to let it get room temperature. 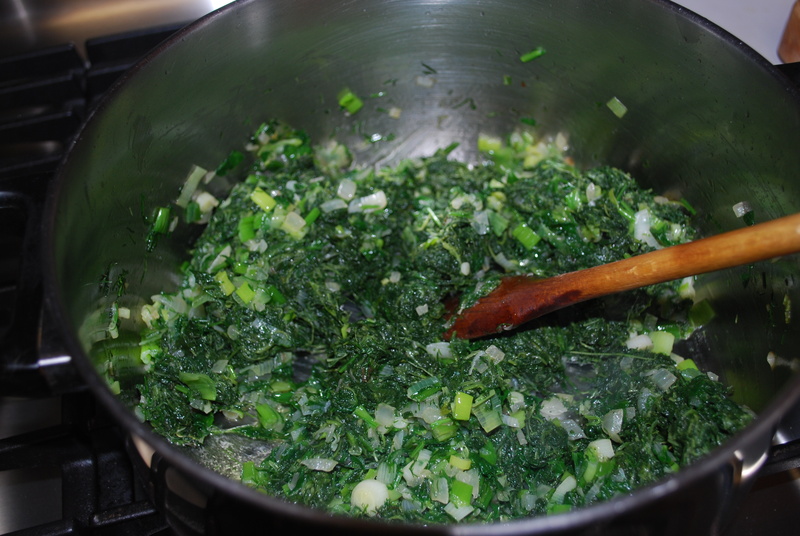 Chop and prepare all ingredients and drain the thawed spinach. 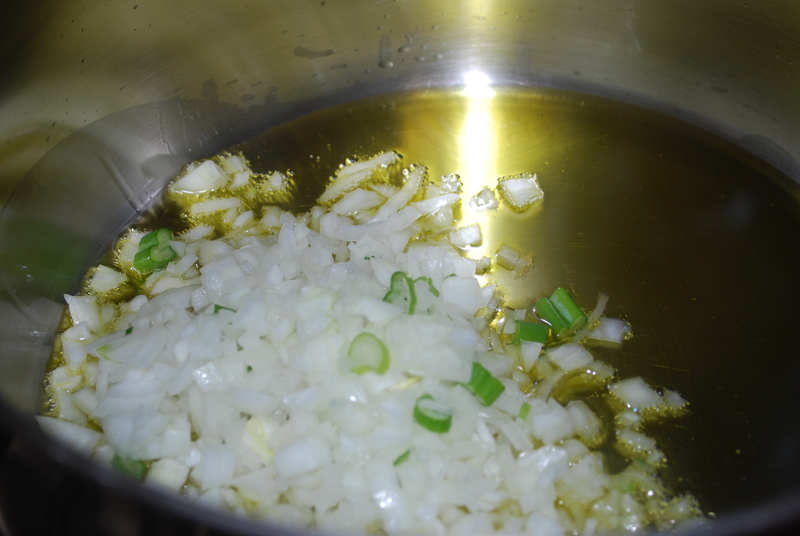 In sauce pan, saute chopped yellow onion in olive oil on medium-high heat until golden, about 5 minutes. 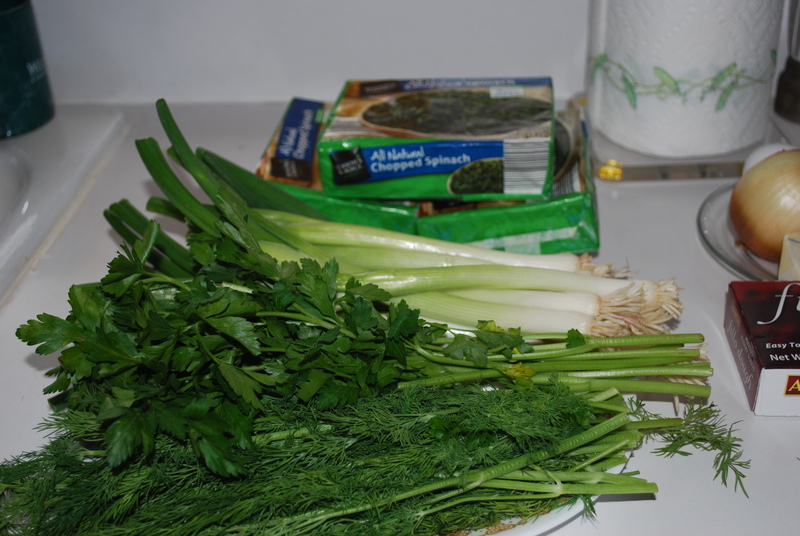 Add in the green onion, parsley, and dill and saute about 5 minutes. 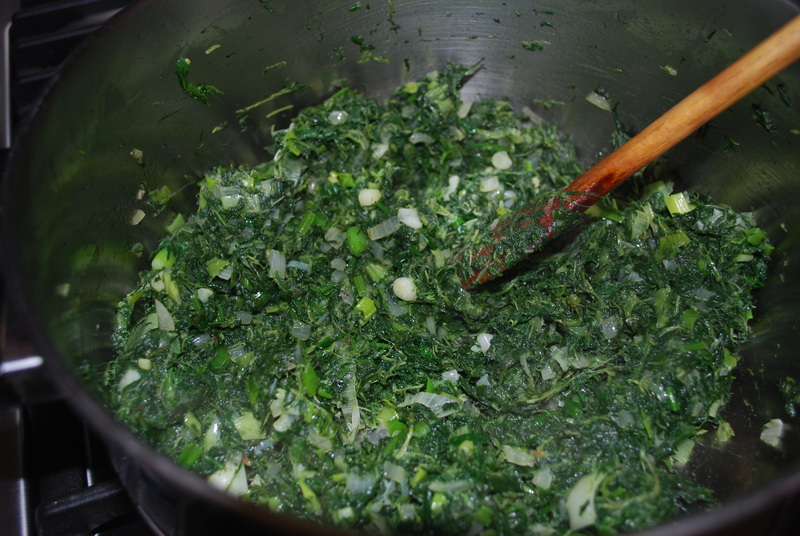 Add the spinach to the mixture and stir for another 5 minutes. Remove from heat. 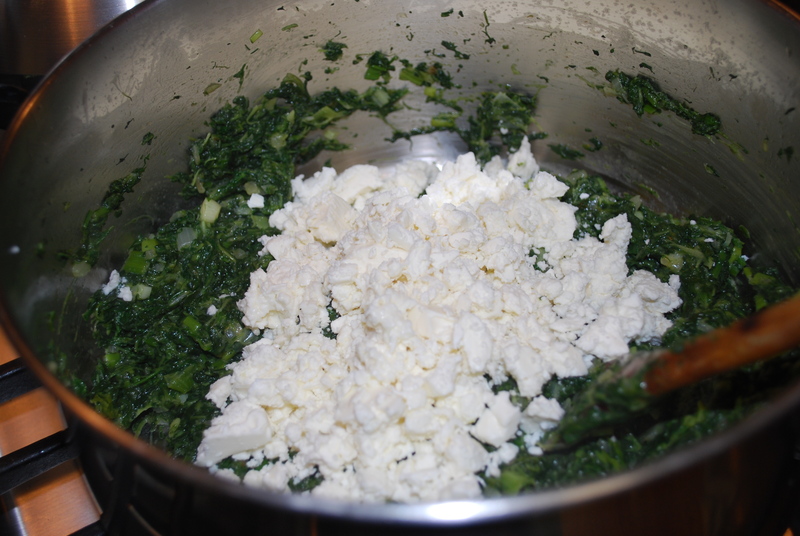 Add Feta cheese to spinach mixture and mix well. 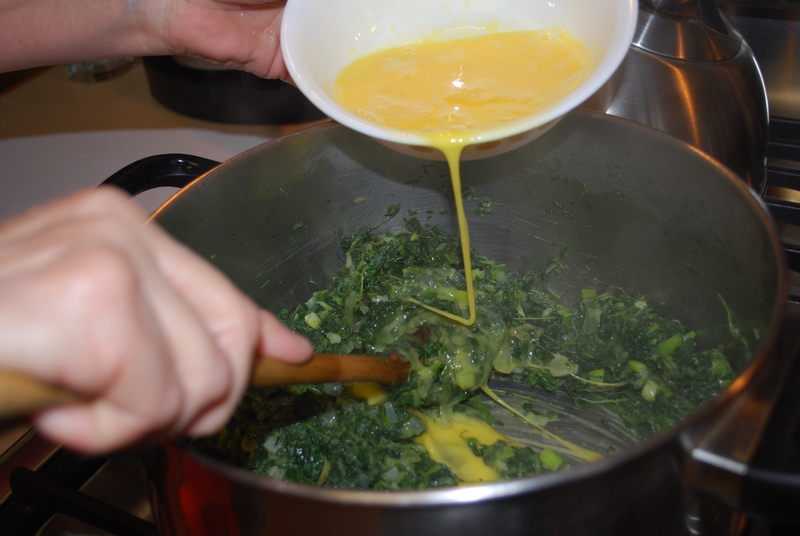 In a bowl, whisk eggs very well, then very slowly add them to the spinach mixture, mixing very well. Season mixture with salt and pepper. 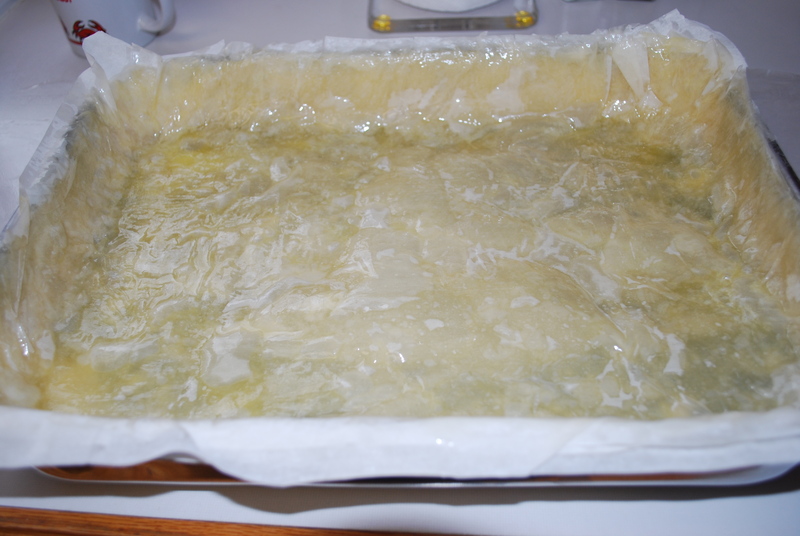 Melt butter in a sauce pan. 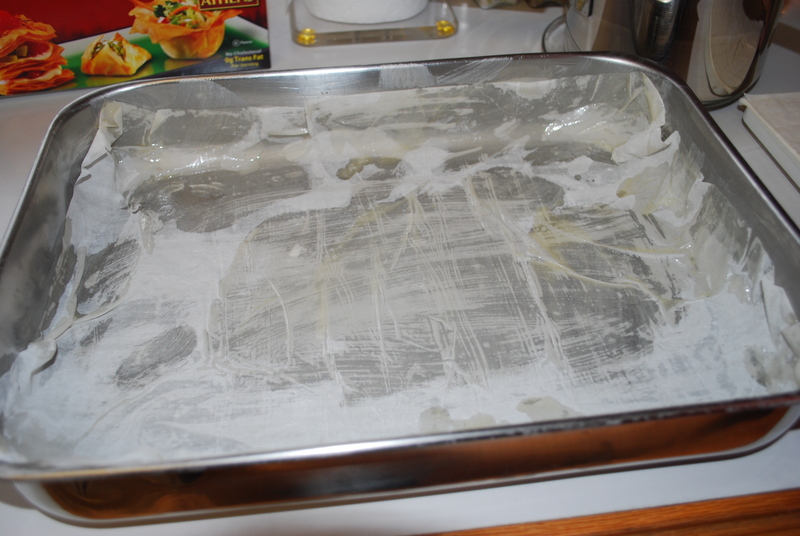 Brush a 13x9x2 baking pan with melted butter. Divide your fillo dough in half. Prepare one half on a clean surface to use immediately, then cover the rest with a damp towel so the sheets don’t dry out. 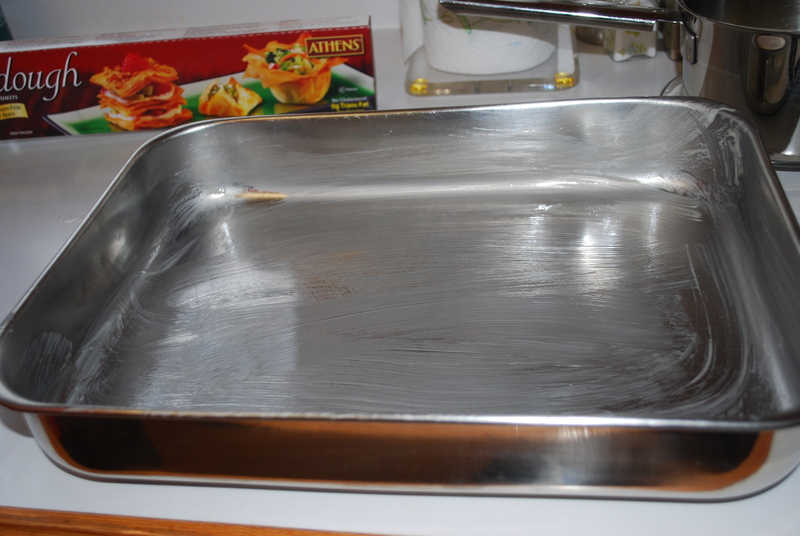 Place one fillo sheet on the baking pan, then brush with butter. Repeat with the 1/2 box of fillo sheets you have prepared. 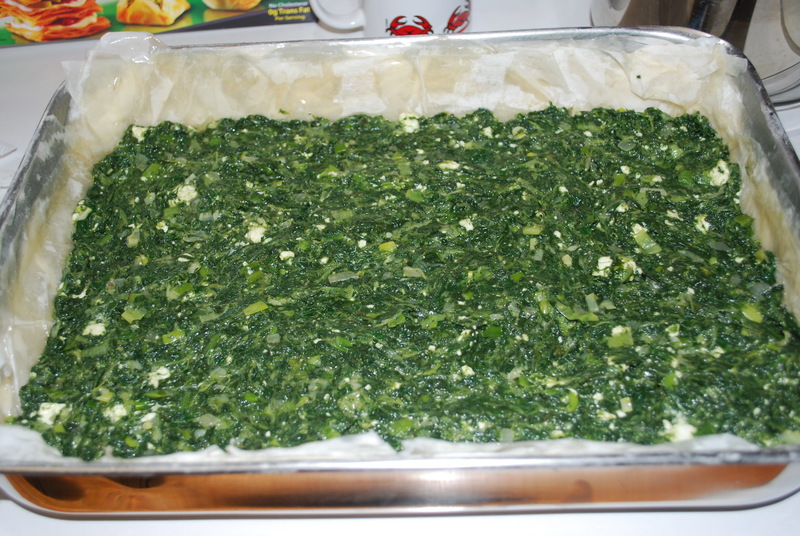 Pour the spinach mixture on top of the fillo sheets in the baking pan, then spread evenly. Get the rest of the fillo sheets ready (1/2 the box) and place one fillo sheet on top of the spinach mixture then brush with melted butter. Repeat until you have used every fillo sheet. 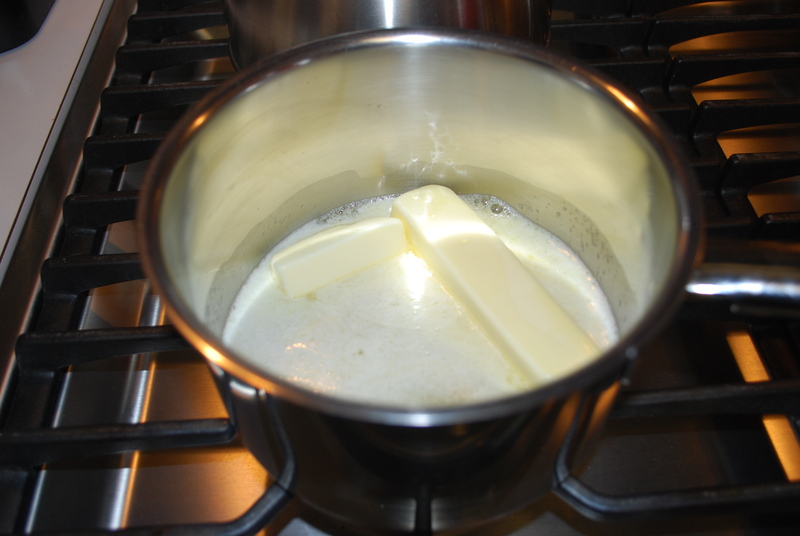 Pour the remaining butter on top. Using a razor blade or a very sharp knife, trip the edges of the pastry to make it even. Cut through the top layers of the pastry horizontally, then across on diagonal to form diamond shapes. Bake in oven at 350 for 45 minutes, or until pastry is puffy and golden. This entry was posted in Appetizers, Dinner, Greek Dishes, Sides and tagged feta, fillo, Greek, phyllo, spanakopita, spinach, spinach pie, the best spanakopita ever. Bookmark the permalink. Thanks Sondra! I’m glad you like it! Thank you so much! This was the recipe I was looking for! I get so tired of people saying to include cottage cheese or parmasaen…that is not suppose to go in there!!! My girls will be thrilled when they see I made it again! I know how you feel – there are so many different versions. Let me know how it turns out! I hope your girls love it! Good. If you like tuna fish, add 1/2 Cup to a Cup depending on if you like tuna, and experience the great surprising taste!! 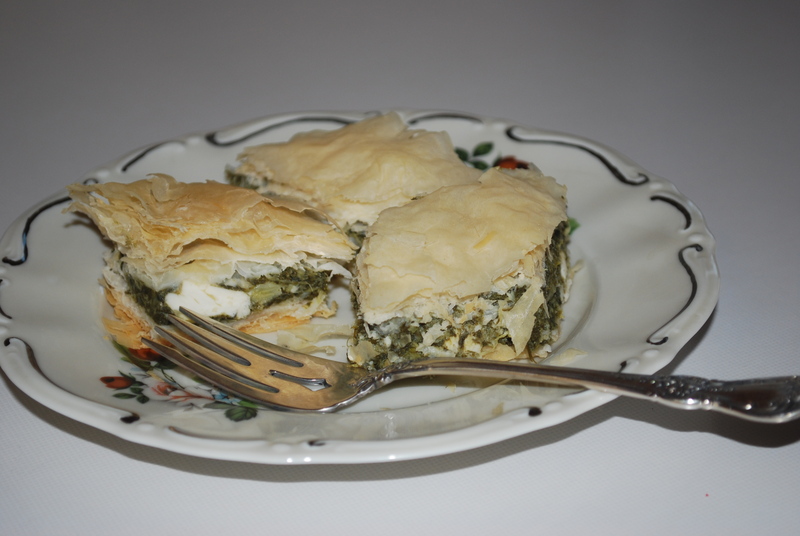 I used to work in greektown in Detroit Michigan and this recipe is better than any I have eaten there. I have made it several times, me and my family just love it! !